The Track Family Fun Park is one of the most visited attractions in Branson where you can enjoy tons of fun and adrenaline pumping activities for the whole family. This Track Family Fun Park has four fun-filled locations in Branson. Each location offers many fun rides that include bumper rides, go-karts, bumper boats equipped with supersoakers, kids rides, and the incredible 100-foot tall super swing Skycoaster, and many more. The park has been operating in Branson for over 30 years providing great family entertainment with no gate admission. At the Track Family Fun Park, you will always find a perfect ride that suits your age, weight, and height. With 14 different go-kart tracks at the park, there’s no reason that you can’t enjoy the best ride of your life. Many of the fun-packed ride activities at the park will let you experience an exhilarating and heart-pounding ride that you haven’t experienced before. One of the most popular ride attractions at The Track Family Fun Park is the Heavy Metal High Rise. This high rise ride is a steel and concrete go-kart track that reaches over four stories high at Track 4 at the fun park. This go-kart ride is 1,200 feet long and consists of 200 tons of steel and 700 cubic yards of concrete. A thrilling ride with Heavy Metal Rise will let you experience a spiraling, twisting, elevating, and turning with more fun on the concrete track. After you have enjoyed a four-story spiral ride, it goes down with a thrilling three-tiered slope back to the ground. 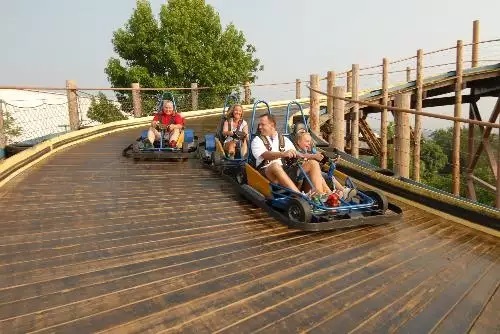 At the family fun park, you can also have the chance to enjoy an exciting ride with the two go-kart wooden tracks namely Wild Woody and The Lumberjack. Wild Woody is a high-rise wooden track that offers a twisting and turning ride. This is a ride which is hard to miss when you drive in Branson. At four stories high and a length of 1,440 feet, it looks like an oversized wooden roller coaster. This wooden ride which is located at Track 3 is a kind of go-kart racing that has ups, downs, twists, and turns and offers a great view too. Height requirements for this ride is 36” and up for passengers, and 58” and up for drivers. Converted from a mini golf course, the thrilling Lumberjack race track is the original wooden high-rise go-kart track in Branson. With the height equivalent to three stories high, this unique go-karting experience will take you to a new heights with two huge spirals of fun. Built in 2001 and with a length 1,186 ft, it is still the favorite wooden track of many ride enthusiasts. Lumberjack race track features a smooth wooden surface, 2 full spirals, 1 blind peak, and a logging theme around the track. Lumberjack has the same height requirement as Wild Woody. Road Course Track is another exciting track that you can enjoy at the family fun park. This track offers tighter and higher banked curves and has more elevation changes than a traditional concrete track. Having a longer track design, Road Course Track can handle more go-karts than the Classic Track at Track 3. This fun ride is sure to give the whole family an awesome ride experience. Sprint Track is another beautiful track that can only be enjoyed by grown-ups (valid driver’s license required – no passengers). Sprint Track is similar to kids’ go-kart track. Located at Track 3, this awesome track is only 275 linear foot banked track. It’s a concrete track, banked corners, and the fastest go-karts of all tracks. Height requirements for drivers is 54” and must have valid driver’s license. If you want to experience a thrilling ride sensation that offers family-style go-kart thrilling ride in a concrete surface, go for Classic Go-Karts. This go-kart can be enjoyed at Track 3, Track 4, Track 5, and at the Track at Pirate’s Cove. Each of the track designs is unique, and the go-kart models even vary at the different track locations. The current Classic Track at Track 3 was the first track that opened in 1981. Kiddie Go-Karts is another go-kart thrilling ride that you can enjoy at the fun park. In this kiddie ride, kids are behind the wheel to make their own direction. It provides a perfect size and speed even for 4-year-old kids driving in a controlled environment. It’s great for parents to take a photo of their kids maneuvering by themselves. For much older kids, they can try out the Rookie-Go-Karts. As they are bigger, they can easily move with ease as the track designs have larger ovals. The Rookie-Go-Karts can help kids gain mastery and get more comfortable behind the wheel before moving up to the grown-up level tracks. Besides the go-karts rides, the Track Family Fun Park features a kiddie amusement rides at Kids Kountry at Track 3 and 4. Spending a wonderful vacation in Branson especially enjoying a fun ride at the family fun park is really great for kids. And the kids will surely love the many exciting and thrilling rides at the Track Family Fun Park where many of them are sized just for them. Another thrilling and exhilarating ride that you can enjoy at the track is 100-foot tall super swing Skycoaster. This giant swing combines elements of skydiving and hang-gliding. To start this thrilling ride with the Skycoaster, you will be harnessed and pulled up 100 feet in the air. This ride can be experienced with one, two or three people at a time. Once you are pulled up from below you will feel a breathtaking 70-mph swinging adventure. The park also features bumper rides where bumping is a must. Bumper boats are a great way to enjoy thrilling rides combined with water fun activity. 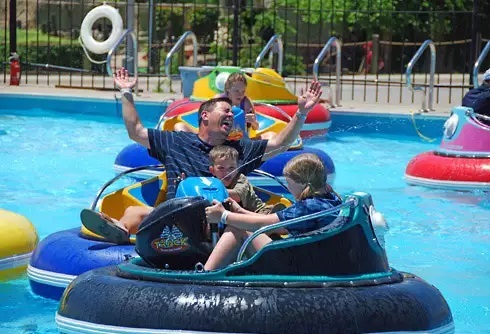 Bumper boats or Supersoaker boats are equipped with water cannons that make this boat ride a unique fun activity where bumping and soaking is key to strategic water battle. If you prefer bumping without soaking, try the bumper cars at Track 4. Batting Cages is one of the new attractions at the Track Family Fun Park that can be found at Track 5. This attraction features four stations that are each equipped to throw four different speeds of both baseball and softball. You can purchase rounds of 20 pitches with Track credits. If you want to host a party or any group event, you can add batting cages for a special add-on price. You can even rent a batting cage and receive consecutive pitching for a half or one hour. After spending so much with fun ride outdoors, you may now want to try an indoor fun with the Laser Tag. This indoor fun at Track 5 is great for the whole family, group, or birthday party. This fun activity will let you navigate the black-lit maze and test your aim with laser beams that you can actually see. Younger members of the family can still enjoy the fun as child-size vests are available. When the exciting game is finished, each player will receive a scorecard that ranks all the players and give you game statistics. The Track Family Fun Park is one of the best attractions in Branson that offers tons of fun and heart-pounding activities for the whole family.